When you’re camping or backpacking, it’s easy to quickly develop your own personal scent. After backpacking all day, it’s hard not to end up sweaty and dirty. At the same time, you may not always have the opportunity to have a hot shower, let alone a cooked meal. While camping or backpacking, you amenities are pretty limited and you definitely start to miss modern technology. However, as a camper or backpacker, not having an alarm clock or Facebook is the least of your issues. What’s important is how you’re going to stay clean. Clean is a hard term to define when on the road, however, you want to be able to feel comfortable and that means you have to pay attention to hygiene. That being said, let’s take a look at everything you need to know about the best biodegradable soap there is on the market. Most people think that soap is soap and that every bar of soap biodegrades. Which makes sense: you see it bubble, froth and then go down your drain. However, there is quite a difference between regular soap and biodegradable soap, believe it or not. Regular soap is filled with chemicals that actually harm rivers, lakes, soil and wildlife. However, when you’re showering at home, these chemicals are processed through your city’s water filtration system, thus, preventing any harm from occurring. So, if you’ll be camping or backpacking, you won’t have that filtration system between you and your environment. So, you’ll want to ensure that you’re not damaging your surroundings by using proper hygiene products. Taking extra precaution by using biodegradable soap means that you will not contaminate your environment with chemicals that are not environmentally-friendly. Though it sounds complex, it’s really quite simple. Biodegradable soap is essentially made from ingredients that can be broken down naturally via bacteria. Non-biodegradable soap instead, would sit in the soil for a long period of time. In order for soap to be considered biodegradable, 90% of it has to be able to break down into carbon dioxide, water and biological material. This process must be able to occur within a 6 month time period from when it was first used. What chemicals should you watch out for? Many non-biodegradable soaps come with an array of chemicals that are unable to break down. If you’re wondering what those chemicals are, they’re triclosan, triclocarban and phosphates. Both triclosan and triclocarban are chemicals that are difficult to break down and are unable to be filtered during the filtration process. When these two chemicals reach rivers and lakes, they disrupt the balance. Phosphates are also highly dangerous for the environment due to their inability to break down. When they reach lakes and rivers, they promote the growth of algae which depletes the oxygen in the waters, causing plants and wildlife to die. What should you look for in biodegradable soap? Many people say that when using biodegradable products, they don’t feel as if they’re really doing the job. However, that’s normal since you’re used to a specific product. This will take some time for you to adjust to biodegradable soap. However, there are some key ingredients that you need to look for in camping soap that’ll make sure you’re squeaky clean. Look for ingredients such as sodium lauryl sulfate and lauryl alcohol – both ingredients do the job and of course, are biodegradable. Remember, make sure the soap doesn’t contain phosphates and triclosan/triclocarban. How do you use biodegradable soap? You probably think that using biodegradable soap is the same as using regular soap, however, that’s not the case. You won’t be able to simply just throw away your biodegradable soap into a lake, river or stream. Though it is biodegradable, it’ll take up to six months in order for it to fully degrade. So, what you’ll need to do is after you’re finished using it, you’ll need to bury it in the ground, at least 60 meters away from any source of water. Dig yourself a hole and bury the soap. The bacteria in the soil will do the rest of the job by breaking it down. What other backpacking/camping hygiene products are biodegradable? You now know everything about biodegradable soap, however, have you ever thought about the other products you’re using? Here are some other products which you can purchase in biodegradable form. Biodegradable dish soap – Most likely, you’ll be doing some dishes while you’re camping or backpacking. If you’re at a campsite, they’ll have an area where you’ll be able to wash your dishes safely. Biodegradable sunscreen – Though sunscreen protects you from the sun, there has been long debates regarding the chemicals contained in your bottle of sunscreen. If you want to protect yourself from the sun, but take a more healthy and natural root, you can use biodegradable sunscreen. Biodegradable shampoo & conditioner – There are many biodegradable shampoo and conditioner products that you can use. However, remember, though they’re biodegradable, you still don’t want to use these products directly in rivers and lakes. Biodegradable toothpaste – People forget about toothpaste, but it can actually do some damage to the environment, especially if you’re brushing your teeth by a lake or river. That being said, if it damages the environment, maybe you shouldn’t be putting it in your mouth. Biodegradable toothpaste is not only healthy but it’s environmentally friendly and costs the same as regular toothpaste. Biodegradable insect repellent – You don’t have to douse yourself in chemicals in order to keep the bugs away. Biodegradable insect repellent is a natural and healthy way to keep away the mosquitos. 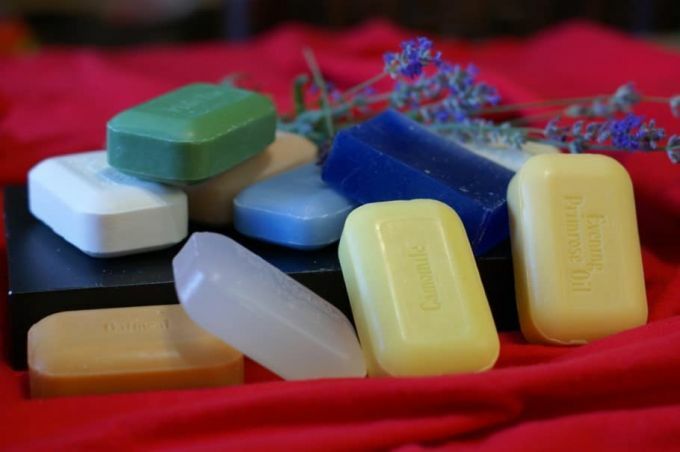 Now that you know what biodegradable soap is and how you should use it, it’s time to look at the best camping soap that’s currently available on the market. Coghlan’s Biodegradable Camp Soap is a multi-use soap which can be used to clean utensils, dishes and your body. It’s a small bottle which you’ll love, especially if you’ll be carrying a backpack. This handy bottle will keep you clean through your trip and if you’re wondering about the bottle, well, that’s also biodegradable as well. You don’t need a specific type or temperature of water in order to use the soap, whatever water you use, it’ll do the job. Though, if you’re going on a long distance trip, you’ll want to stock up on a couple of these bottles, as they only come in this one size. Related: Remember, you’ll need to bury your biodegradable soap after you finish using it, so you’ll need a trowel. Coghlan has their own Backpacker’s Trowel which is super lightweight – only 2 ounces. That’s what you’ll need while on the road. Also, if you happen to run out of soap or don’t necessarily need to use soap but just to wipe yourself, you can use Coghlan’s Biowipes. They’re fragrance-free and come in a travel-friendly pack that you’ll be able to use quickly and efficiently. Dr. Bronners is well known for making not only biodegradable products but they’re also certified fair trade. So, if you want to relieve your conscious, the Dr. Bronners Bar will definitely lift some of your environmental and political footprints. Among campers and backpackers, the soap itself is a favorite. It doesn’t come in a container or bottle, it’s simply a bar of soap, so you’ll need to bring your own carrying case for it. It gives an incredibly smooth and soft lather due to the organic hemp oil and is peppermint flavored, so it’ll wake you up. Dr. Bronners have a variety of other scented bars, so if you’re not a fan of peppermint, don’t worry, you have options. Related: If you’re looking for Dr. Bronners in a bottle form, you can purchase the Pure-Castile Liquid Soap, however, it is a pretty large bottle (32 oz). It may be a little too big for you if you’re going to be backpacking, however, if you’re camping and weight isn’t an issue then you should opt for the bottle. If you have an allergy issue or you’re sensitive to fragrances, then the Outdoor RX Biodegradable Soap is a great option. Not only is it biodegradable, but in addition, it’s fragrance-free. This soap is safe for multi-purpose use, as you’ll be able to wash your body, hair, clothing and kitchenware with it. It’s pretty versatile. The formula is suitable for salt and fresh water in both hot and cold temperatures, so need to worry about where you’ll have to shower. Also, if weight is an issue, this is lightweight so you can just throw it into your backpack without worrying. Related: Sometimes you won’t need soap, but you’ll just need some wipes to quickly clean yourself. In some situations, won’t have access to water. So, if that’s the case, you can use wipes. Trailblazer came out with Biodegradable Bamboo Wipes which are all-purpose wipes that are 100% biodegradable. They’re made with Tea Tree extract, vitamin A and Aloe Vera, so they won’t dry out your skin. All Terrain Made Wonder Wash which is a great soap if you have an issue with dry skin and fragrances. You’ll be out in the wild so you probably won’t be bringing your entire facial cleansing routine with you. That being said, your skin may be susceptible to drying out or becoming oily. Well, Wonder Wash is not only biodegradable but it’s also pH neutral, so your skin won’t be stripped of its natural oils. It is highly concentrated so you won’t need a lot in order to get the job done. You’ll be able to use this on your body, face, hair, clothes and cooking equipment. So, if you have sensitive skin, this is a great option to consider. Related: Instead of carrying a roll of toilet paper with you, why not try out Coleman Camper’s Toilet Paper. It’s purposely designed to be compact so that it reduces bulk in your backpack. It’s biodegradable and it comes in an easy-to-use dispenser. Unlike the other biodegradable soaps on the market, Coleman’s Camp Soap are actually dissolvable sheets. What happens is when coming into contact with water, the sheet dissolves, producing a soapy lather. So, all you need is water. A single pack comes with 50 biodegradable sheets which are environmentally friendly. This soap is ideal for washing kitchenware and hands, we recommend it for the body, face or hair. You’ll be able to use it in hot or cold water, so it’ll activate regardless of the temperature. Related: If you purchase this but still need soap for your body and hair, try the Sea to Summit Trek and Travel Pocket Soap. Not only is it biodegradable but it’s also phosphate and paraben free. It’s also TSA Carry-on compliant, so you can literally carry it in your pocket. Kirk’s is one of the first companies to produce biodegradable soap, with their Natural Castile Soap being one of the top selling. What’s great about their soap is that not only is it environmentally friendly but it contains no animal by-products, it’s never been tested on animals, it’s hypoallergenic and is free of synthetic detergents. Their castile soap is very well known for leaving your skin incredibly smooth and soft without disrupting your body’s natural pH. It comes in a pack of three, so it’ll be able to last you for a while. Related: If fragrance isn’t an issue for you, you can try out Kirk’s Natural Coco Castile Soap with Aloe Vera. It produces a rich and creamy lather, that’ll keep your skin hydrated and soft. Plus, it’s also gluten-free, so if you have a gluten issue, that’s taken care of. If you’re looking for a biodegradable soap that does it all, well this is one of them. Campsuds is an all-purpose cleaner that you can use for personal hygiene, laundry, dishes, and equipment. What’s great about this soap is that it works literally anywhere. Hot or cold water, salt or fresh – it doesn’t matter, it’ll get the job done. Though, it does come in one large container, so you’ll have to distribute it into a travel size bottle. Related: Sunland created a Microfiber Towel that’s highly absorbent, so when you’re having a shower in a lake or river, this towel will help you out. It’s lightweight and compactable, so it’ll be easy to throw into your backpack. The best part is that it’s fast drying, so you won’t have to worry about it weighing you down after using it. The Sea To Summit Wilderness Wash is a great option that’ll last you a lifetime. It’s highly concentrated, so you won’t need a lot to get the job done. It comes in a small, travel size bottle with a nozzle and secure lid, preventing it from spilling out inside your backpack. You’ll be able to use it for personal hygiene, kitchenware, clothes, and outdoor gear. It is also fragrance and phosphate free, so everyone can use it. Sea To Summit does recommend that you do use it 300 ft away from any river, lake, or stream, that way, you won’t contaminate the waterways. Related: Sea To Summit designed a Citronella Wilderness Wash that does that same job as the original wilderness wash, however, comes in the fresh scent of citronella. Plus, if you have an issue with insects and bugs, the scent may help to deter them. Dr. Bronner’s Castile Soap line is one of the best on the markets. You can even use this soap at home, which many people do. You don’t need a lot and can be used for washing dishes, laundry, bathrooms, body and hair. Their products are all fair trade and are certified USDA organic, in addition, it’s also certified Vegan. The vegetable-base is extremely gentle so if you have sensitive skin, you’ll be able to use it. You can also buy a large bottle rather than the bar of soap if that’s what you prefer. Related: Like said prior, you can opt for the liquid soap instead of the bar. It’s Dr. Bronner’s Pure-Castile Liquid Soap and comes in a 32 oz bottle. The citrus flavor stimulates the skin and awakens the body. Now that you know what biodegradable soap is, how to use it and the top soaps on the market, it’s time you went out and chose one! Make sure you choose a soap which suits your needs. You may have to try a couple until you find out which one you like best. Let us know in the comment section below which biodegradable soap you like!